Welcome back from holidays with another looser that we have loved very much… graphics are maybe better than the architecture, but we really loved the idea of a museum based on the flat dimension of the page. 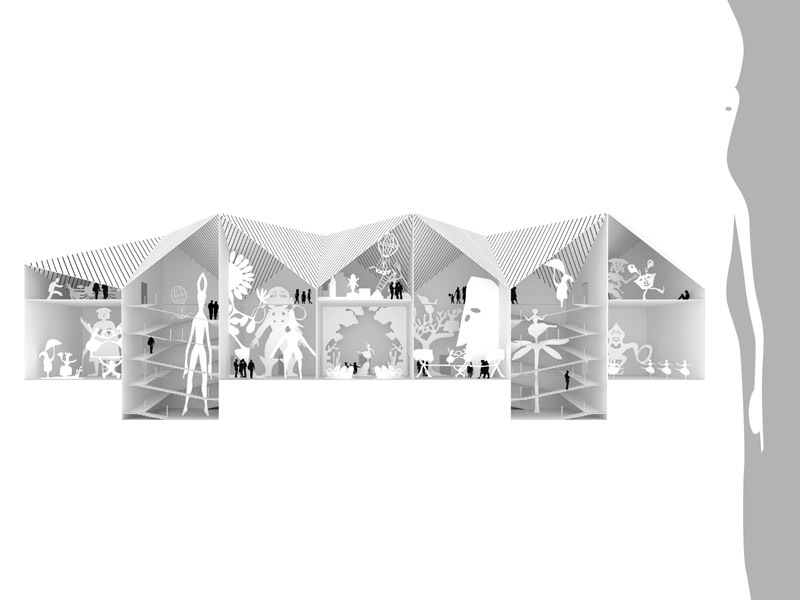 Ceci tuera cela, was the prophecy of Victor Hugo about the destiny of architecture, going to be killed by the rising popularity of press and books, and the substitution of cathedrals as spatial narratives by the at space of the page. But new medias don’t really kill the old ones, but just add new ways of communicating, leaving to the old ones their own specic character and meaning. That’s why Flatland wants to celebrate the two-dimensional space of the book that, beyond its limits, offers an unlimited space for imagination, as no other media does. The new building, composed of a series of volumes agrregated as a small village, is inserted and modeled in the site in order to respect the scale of the context on one hand, and to have an outstanding facade toward the garden. 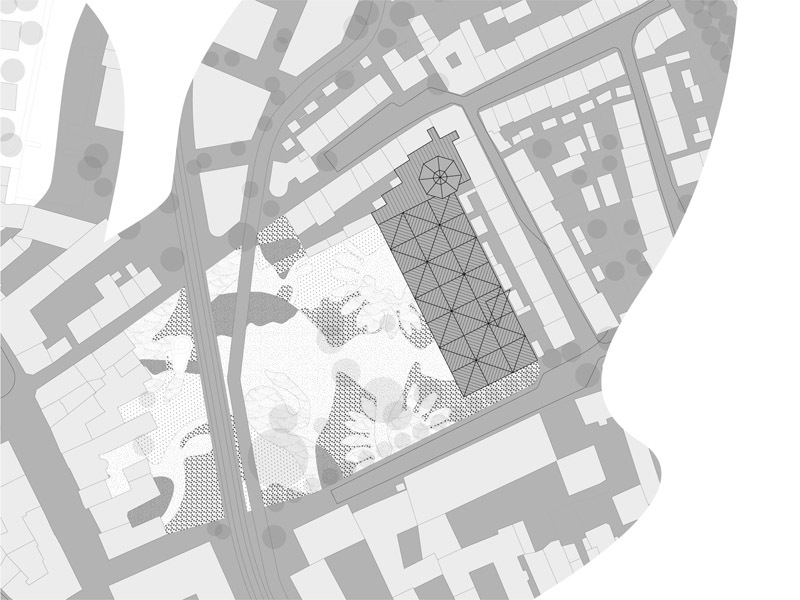 The roof is therefore articulated to reach the medium height of the surrounding houses on the NE and NW sides, and to open up a generous glass facade towards the garden, where all the activities related with public space are placed. 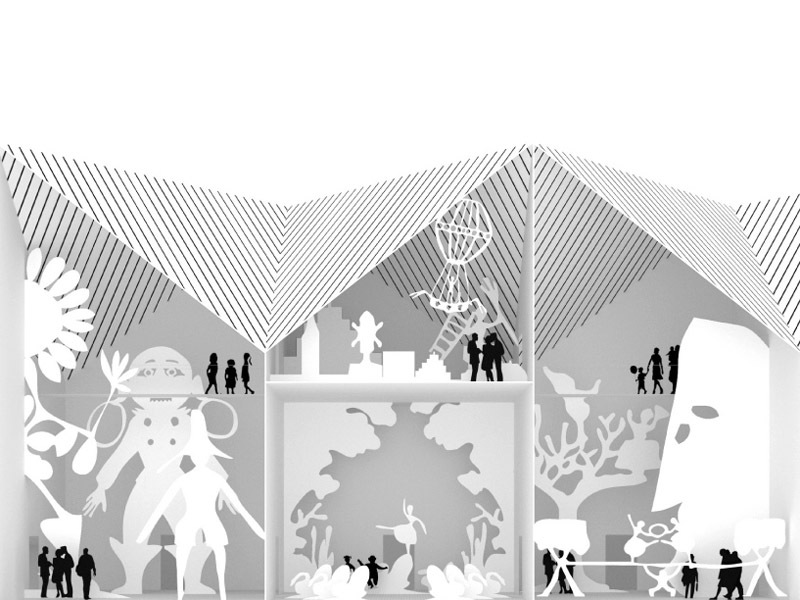 The interior is a tridimensional labyrinth, made of cells/modules that could be dedicated to specific themes and tales of the Andersen’s work. 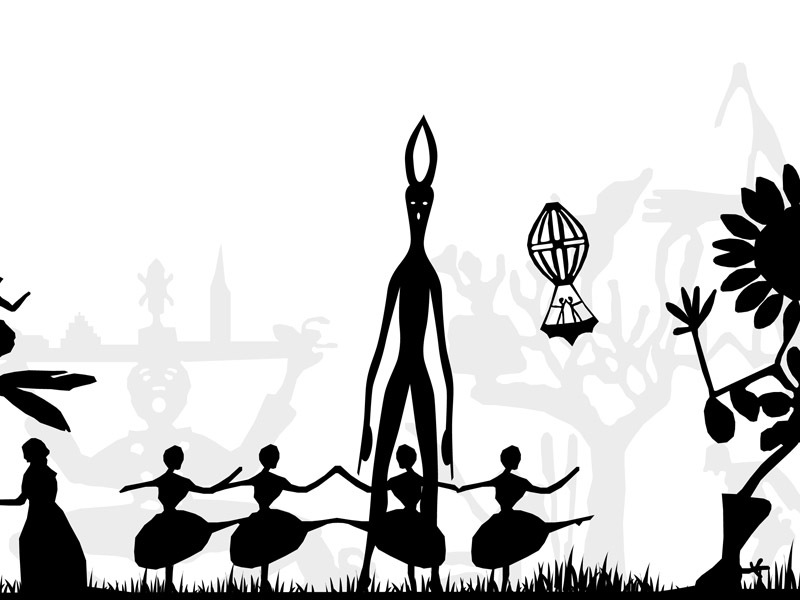 Flatland is an invitation to a multi-dimensional esploration of the fairy tales of Andersen, starting from their original media, the book. 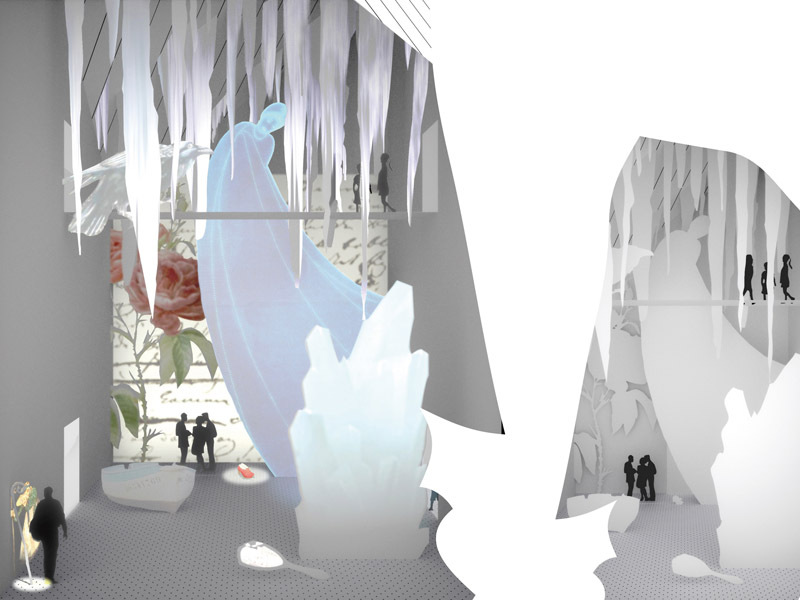 The exhibition concept is based on the actualization of the two-dimensional space of the page with multimedia interactive devices – videoprojections and sounds that give life – and three-dimensional depth – to the abstract silhouettes taken from the most beautiful illustrations made during a century and placed in space like in a theatre scene (above, a room dedicated to The Snow Queen). 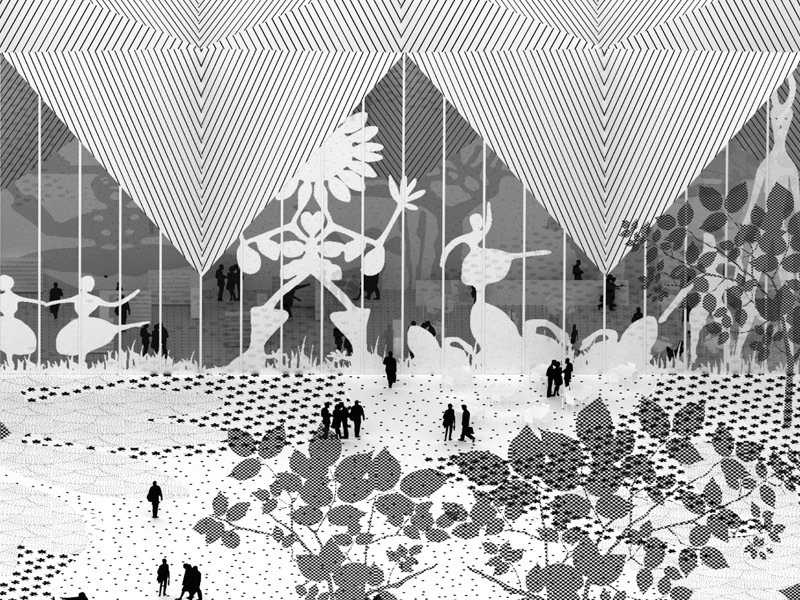 Some figures taken from Andersen’s papercuts are superimposed and intersected to create the garden’s layout, creating a sequence of paths and spaces with different paving and plants. Here, the presence of the Author will be perceptible only from an aerial view of the site, and, like the tales and the experiences of our childhood, will be the inconscious footprint of future life. 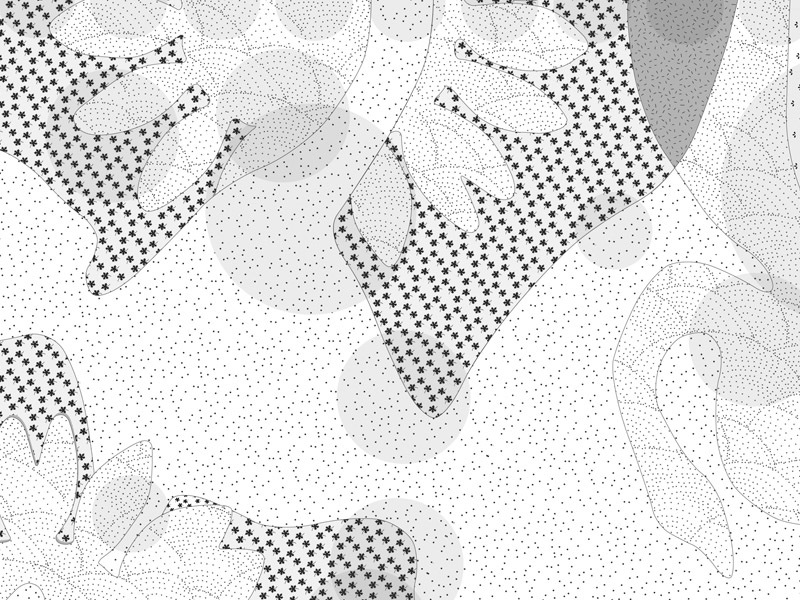 Graphic rendering experimentations while working on the competition, that brought us to the second proposal..